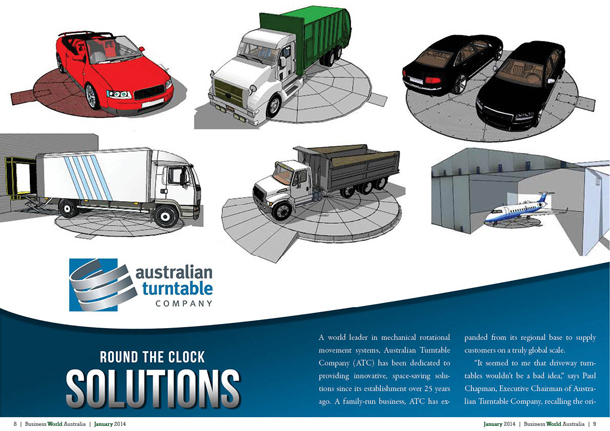 A world leader in mechanical rotational movement systems, Australian Turntable Company (ATC) has been dedicated to providing innovative, space-saving solutions since its establishment over 25 years ago. A family-run business, ATC has expanded from its regional base to supply customers on a truly global scale. “It seemed to me that driveway turntables wouldn’t be a bad idea,” says Paul Chapman, Executive Chairman of Australian Turntable Company, recalling the origins of the company. “My wife Netty and I started off the business in 1987, we were incorporated in 1990, and we just went from there,” he says. Early in the company’s life, ATC focused on the exhibition and automotive retail industries. Twenty years later, the company now offers its services – which encompass full design, modelling, manufacturing and project management – to a wide range of sectors, including mining and the arts. Their core business, however, is providing space-saving solutions in commercial and residential situations – such as loading dock turntables for trucks and car driveway turntables, respectively. Since going global in 1999, Australian Turntable Company has serviced customers in these industries on an international level, and today boasts of project involvement in fourteen countries and four continents. Current projects include 700 ton capacity turntables for the South American mining industry and 60 revolving floors for a Dubai hotel development. According to Paul, ATC attracts this high calibre of clientele due to their reputation. In their 20-plus years of business, they have become recognised internationally for delivering quality, on time and on budget – whilst making sure customers have their expectations met and hopefully exceeded. ATC’s close ties to their customers are mirrored by the company’s strong internal relationships. Paul describes their workforce – which includes a second generation of the Chapman family – as “strong and growing.” He says everyone that works under the ATC banner is dedicated to maintaining the company’s sterling reputation in the industry. Finally, ATC also enjoys very close ties with their suppliers. The supply partners they do work with, however, clearly understand ATC’s quality standards and requirements, and have worked closely with ATC in the long term. Many of the company’s suppliers have been working with Paul for 15 to 20 years. Australian Turntable Company’s merits have not gone unnoticed by the industry they work in. Recently, at the Master Builders’ 2013 National Excellence in Building and Construction Awards, their hard work and dedicated was recognised with the National Export Award, in the Products and Manufacturing under $25 million category. Paul credits Australian Turntable Company’s exporting success to the respect they have earned from their customers. 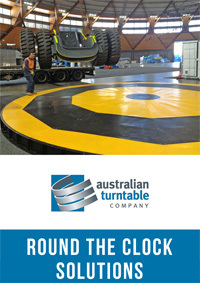 Moving forward, Australian Turntable Company is expecting solid growth over the next five years, especially on the back of investments made into its R&D program, which will gear the company towards developing products for the mining and construction sectors, as well as expanding into the arts industry.